This video shows aerosol emission and transport from September 1, 2006 to April 10, 2007. Also included are locations, indicated by red and yellow dots, of wildfires and human-initiated burning as detected by the MODIS instrument on NASA's Terra and Aqua satellites. Credit: NASA Goddard Space Flight Center. Download the animation here. The residents of Beijing and Delhi are not the only ones feeling the effects of Asian air pollution — an unwanted byproduct of coal-fired economic development. The continent's tainted air is known to cross the Pacific Ocean, adding to homegrown air-quality problems on the U.S. West Coast. But unfortunately, pollution doesn't just pollute. Researchers at NASA's Jet Propulsion Laboratory and the California Institute of Technology, both in Pasadena, California, are looking at how Asian pollution is changing weather and climate around the globe. Scientists call airborne particles of any sort — human-produced or natural — aerosols. The simplest effect of increasing aerosols is to increase clouds. To form clouds, airborne water vapor needs particles on which to condense. With more aerosols, there can be more or thicker clouds. In a warming world, that's good. Sunlight bounces off cloud tops into space without ever reaching Earth's surface, so we stay cooler under cloud cover. But that simplest effect doesn't always happen. If there's no water vapor in the air — the air is dry — aerosols can't make clouds. Different types of aerosols have different effects, and the same aerosol can have different effects depending on how much is in the air and how high it is. Soot particles at certain altitudes can cause cloud droplets to evaporate, leaving nothing but haze. At other altitudes, soot can cause clouds to be deeper and taller, producing heavy thunderstorms or hailstorms. With so many possibilities, aerosols are one of the largest sources of uncertainty in predicting the extent of future climate change. 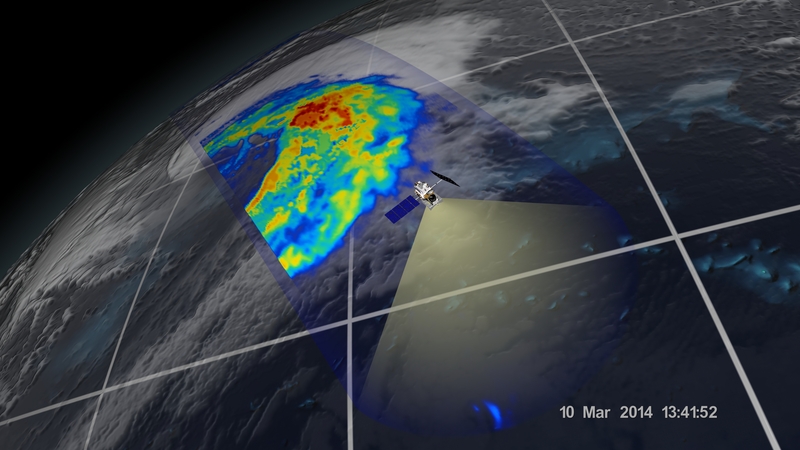 An extra-tropical cyclone seen in the Pacific Ocean off the coast of Japan on March 10, 2014, by NASA's GPM Microwave Imager. "We found that pollution from China affects cloud development in the North Pacific and strengthens extratropical cyclones," said Wang. These large storms punctuate U.S. winters and springs about once a week, often producing heavy snow and intense cold. "Large, convective weather systems play a very important role in Earth's atmospheric circulation," Jiang said, bringing tropical moisture up to the temperate latitudes. The storms form about once a week between 25 and 50 degrees north latitude and cross the Pacific from the southwest to the northeast, picking up Asia's pollutant outflow along the way. Jiang noted that Asian emissions have made him and some other climate researchers conceptualize Earth differently. "Before, we thought about the North-South contrast: the Northern Hemisphere has more land, the Southern Hemisphere has more ocean. That difference is important to global atmospheric circulation. Now, in addition to that, there's a West-East contrast. Europe and North America are reducing emissions; Asia is increasing them. That change also affects the global circulation and perturbs the climate." • Researchers are looking at how Asian pollution is changing weather and climate around the globe. • They found that pollution from China affects cloud development in the North Pacific and strengthens extratropical cyclones. These large storms punctuate U.S. winters and springs about once a week, often producing heavy snow and intense cold. How much do you know about aerosols?